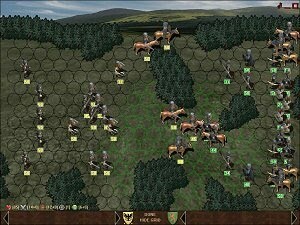 Knights of War is a free turn-based strategy game set in medieval England. It was influenced by similar games like Warlords, Shogun Total War and Heroes of Might and Magic.Players can choose between eight lords to play with, each having different bonuses. The main objective of the game is to capture all England's provinces by defeating all of your enemies and therefore to unite all England under your rule. To do this, you will have to develop your economy, build structures, improve technologies, conduct diplomacy and raise strong armies. There are three AI types to choose for your computer opponents. Knight is the weakest AI type, warlord the strongest while lord is somewhere in between those two. There is also hotseat mode which allows two or more players to play on the same device by taking turns playing the game.